I have really outdone myself with this one. A salad packed with green goodness and topped with lightly seared sesame tuna. Quick and easy to whip up it’s perfect anytime. I have adapted the salad from Yotam Ottolenghi’s Plenty which is a must have on all recipe book shelves. Ottolenghi has a very special way with vegetables, turning them into the most sensational salads and mouthwatering dishes. Try this and you will know what I mean. Marinate the tuna steaks in the fish sauce and vinegar. Meanwhile fill a medium saucepan with cold water and bring to the boil. Blanch the French beans for 4 minutes. At 3 minutes add the mangetout. Add the peas for the last 30 seconds. Drain and plunge into a bowl of cold water, then drain and dry. Put the coriander seeds, mustard seeds and oil in a small saucepan and heat until the seeds begin to pop. Pour over the beans and peas. Toss together, then add the nigella seeds, red onion, chilli, garlic, lemon zest, coriander, and watercress and gently fold. Spread the sesame seeds on a plate. Take each tuna steak and lightly press onto the plate on both sides to coat with the seeds. Heat a griddle pan to a high heat, add a splash of olive oil. Place the tuna steaks in the pan and just sear for 2 minutes on each side. This will just colour the outside of the steaks leaving the inside pink and juicy. If you prefer the tuna to be cooked through then leave on the pan for a few minutes longer. Remove the steaks from the pan, squeeze over the lemon juice and allow to rest. Serve the salad onto plates. 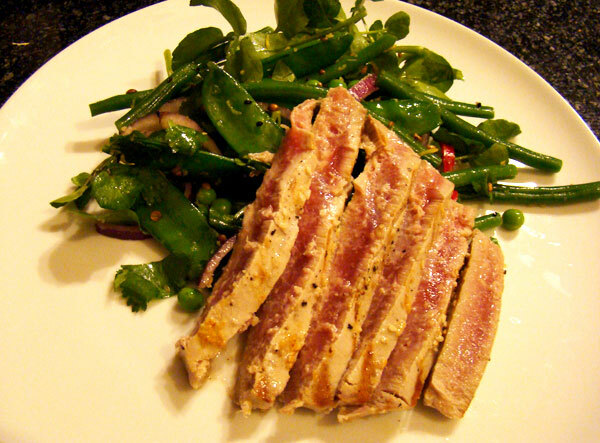 Slice the tuna into strips and place on the salad. Serve immediately. This sounds absolutely delicious! I got Plenty recently, cant wait to use it! Thanks Jayne. You will love Plenty, it’s such a beautiful book and the recipes are perfect for coming into summer.